Being a media and marketing company with unparalleled local-to-national reach, Gannett successfully connects consumers, communities, and businesses. Characterized by a traditional deployment workflow with multiple handoffs and manual tests, Gannett faced challenges in maintaining accurate, repeatable builds. Moreover, several build tests were often run in the wrong environments. Experiencing a “shadow IT” situation on the development side, the client was ready for a change. This is where Seattle, WA based IT automation provider—Chef—came into picture. The customer needed to rebuild a Virtual Private Cloud on Amazon Web Services (AWS) for a development environment that would mimic production. Though none of the tools that the client used earlier were appropriate, Chef worked well with the cloud and both Linux and Windows environments. In addition to the advantages of automation itself, Chef broke down the barriers between development and operations and helped them work together. This ensured increased visibility, effectiveness and speed of the development cycle. 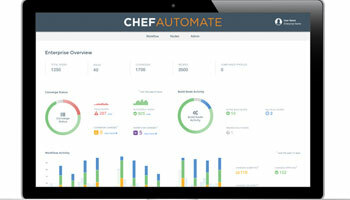 Built on an open source platform, Chef automates persistent, unified delivery of applications and infrastructure, enabling enterprises to deliver software much faster with minimal risks. The firm’s Chef Server—a highly scalable foundation for the firm’s IT automation platform—uses a Domain Specific Language (DSL) to write system configuration or “recipes.” Grouped together as a “cookbook,” these recipes describe a series of resources, including how packages should be installed or services should run. Chef can either run in client or server mode, or in a standalone mode named “chef solo.” As it runs, Chef client queries Chef Server for the latest set of recipes that apply to the current node. As the server determines the applicable recipes based on the node’s roles, the Chef client executes the recipes—simplifying how recipes are written and offering continuous, repeatable results. The Chef environment comprises three components—Chef Server, workstation and nodes.With this, Chef bridges traditional, back-office infrastructure-based IT and the new, front-facing cloud-based IT. “There is explosion of transformation inside mainstream enterprises that are trying to drive innovation velocity through application development and a streamlined set of practices. “Chef is part of that pattern and we find ourselves at the center of the DevOps universe,” explains Barry Crist, CEO, Chef. Chef’s DevOps workflow enables users to quickly and safely deploy changes to applications and infrastructure. It is often a time consuming process to implement the actual pipeline that moves the codes from development to production. Apart from supporting technical challenges, the pipeline should also stimulate practices that support a DevOps workflow. Adopting an unconventional approach of integrating DevOps practices with automation, Chef’s addition to the platform—Chef Delivery—can be used for both infrastructure and application code, providing operations and development teams a common platform for developing, testing, and deploying applications. The firm’s Chef Automate also offers a full-stack continuous deployment pipeline, and automated testing for compliance and security, including complete visibility into operations. The company places as much importance on the Chef team and culture, as their technology. “Time and again, customers have told us that the real magic is how we transform their business through our partnerships,” adds Crist. With an opportunity to become one of the top companies in the software industry, Chef is in a constant attempt to boost innovation, velocity, and quality. Though Crist believes that there would be several big changes in the IT in 2016, the company is geared to stay abreast with added vigor that will enhance growth. Enabling IT departments to automate configuration and deployment processes using innovative software.